Can I Turn a Shed Into a Tiny House? The homeowner built a wood deck in front of the shed and made it look “oh so homey”. Recently we’ve seen several people ask the question of whether you are allowed to turn a shed into living space on some Tiny House-related Facebook pages and groups. When the same topic came up on our own Historic Shed page, we decided we should write about the idea. Understandably, it is an appealing concept to many who dream of an unencumbered Tiny House lifestyle: buy an inexpensive set of 4 walls and a roof set on your property, finish out the interior, and live a debt free life. While, we can’t speak to the practicality of this idea everywhere, we can give some insight into the issues you might run into with this idea in Florida so you can plan accordingly. Use – Zoning will list what type of building uses are permitted within an area. A parcel may be zoned commercial, industrial, residential, residential multi-family or allow for a combination/ variety of uses. It will also describe what type of accessory uses may accompany the main use of the parcel. Size – Local zoning usually spells out minimum and maximum sizes for new construction in an area. It may be a percentage of the lot size or a square foot limit. Height limits, as well as building footprint sizes are listed. While some areas list minimum sizes for primary residences, many areas do not. Quantity – The number of units that may be placed on any particular parcel is also typically listed in zoning code. This is particularly important for anyone thinking of creating of community of multiple little houses or adding a second unit on a residential lot. Accessory Buildings – Most zoning codes will define whether accessory buildings/ accessory dwelling units (ADUs) are allowed in a particular area, and how many. In addition, size and height restrictions and where they may be placed in the yard will be defined. They will also tell what type of uses are allowed in the accessory structures. This may allow for storage sheds, detached home offices, and/or accessory dwelling units. If a shed is allowed, but not an accessory dwelling, you can not legally renovate the shed as an accessory dwelling. As a side note, the difference between a home office and an accessory dwelling unit is often defined by the presence of an oven. Using a Shed on a Trailer as a Tiny Houses on Wheels – Since THOWs were not around when most Zoning Codes were written, you are unlikely to find a section in the zoning code that tells you whether you can legally live in a THOW on your property. Many municipalities apply RV rules to THOWs, so your best bet may be to search for RV living regulations. You may also have luck convincing zoning that Mobile Home regulations are more appropriate for you THOW, should your property allow them. Wind Load Design – The 2010 (5th Ed.) Florida Building Code instituted 3 new Wind Speed Maps for wind load design. Residential buildings (Type II) are designed for a higher wind load rating than buildings designed for use as storage sheds (Type I). This means that wall construction, windows, doors, roof material, etc. may not meet residential code requirements in your area rather than the lesser shed regulations. UPDATE: The Code edition was updated at the end of 2017. Foundation – There are exceptions in the code for concrete foundations for sheds that allow them to be substantially smaller than for residential construction. In addition, a vapor barrier is not required under the slab for sheds, but is for residential construction. Other common shed tie down foundations are often not allowed for residential construction at all. Room sizes – Florida Building Code requires that at least one habitable room in a residence be a minimum of 120 sf. Bathrooms must meet certain clearances and contain a lavatory, toilet and shower. No habitable room may be less that 7′ in either dimension. This applies to all rooms other than the bath, kitchen, closets and utility rooms. Your plans will have to show that it meets all these size requirements. In most cases, you can build a residence as small as 150 sf and meet FL Building Code requirements. As noted above, zoning regulations for your property may require a larger footprint. Room heights – Ceiling heights within residences are a minimum of 7′ (6′-8″ in baths). If you plan to install a loft, be particularly aware of this restriction. Also, many manufactured sheds have 6′ high side walls. Flood Zones – Storage sheds may be installed below the design flood elevation in flood hazard areas. Residential buildings must be raised above the design flood elevation. Windows – Windows of certain sizes are required in living spaces for egress, air quality, and light. Make sure your shed windows are large enough to meet these requirements. Impact requirements – “Storage sheds that are not designed for human habitation and that have a floor area of 720 square feet (67 m2) or less are not required to comply with the mandatory wind-borne debris impact standard of this code.” This means windows in sheds are not impact rated in High Velocity Wind Zones and do not have the required shutters that a residential building would have. Other things to know: In some areas of Florida, you may build a storage shed under a certain size without a permit. This does not mean than you can build a building for other uses, such as a residence, under that square footage without a permit. And you may not change the use of a building without a building permit legally (if you pull a permit for a shed, it can only be used as a shed). Modifications after the fact, done without a permit, can result in you being required to remove your building from the property. In addition, some gated communities have their own set of design standards. This may include regulations on accessory buildings, how buildings should look, and provide minimum sizes for new construction above and beyond what is called out in zoning code. I doubt I have identified all the potential issues with using a shed as the starting point for a residence in Florida, but at least this will help some who are considering the idea. Personally, for all the adaptations that could be required, I would think starting from scratch would be just as easy, albeit perhaps more intimidating. 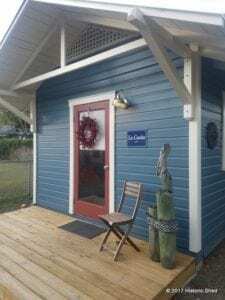 If so, feel free to give Historic Shed a call and we can build a shell that will meet all Florida Residential Building Codes for your dream cottage lifestyle and include your Engineered Drawings. If I put electricity wiring, a bathroom (one sink, stand up shower, and toolet) with a hot water heater inside to make a small living area then what do I need to make it legal? It’ is on a trailer and I don’t plan on living in it. I want to sell it. If it is on a trailer, you can pretty much do as you please with it since there is no reviewing agency that you have to apply to. I live in the panhandle of Fl. and I have turned a 16×40 portable building in to a home on my land. The building I got had 16 on center 2×4 which helped with codes. I have had to go through all the permits and a contractor to have it done. And be legal. But this was cheaper than buying or building a house for me. Patty can you email me mamanimal12@gmail.com to go over the details of what needed to be changed ans or done to the shed? Iam buying a shed this weekend to convert. Hello Patty I live in the big bend area. I live in Ag zoned area way out in the country and would love to turn a shed into a tiny home. Do you have any more info on the process and cost to do what you have done? I would greatly asppreciate it as I am sure others would like to know also. We are loosing our home too foreclose we figure we have 1 or 2 weeks left before we really have to move. We don’t have enough money to get anything and they won’t let us live in a shed in Florida. We would need land to put your shell on it and work with it our credit not good and my mother and I can make payments being on social security and me on disability. We have a lot of adopted animals we take care of and but we can not get a home with them but we will not depart with them either. If you can help us and work with us please let me know.ASAP! I have an existing shed that came with my home in Orlando, FL 32807 – zone R-1A/AN, am I able to convert it into a room, without any permit etc, I plan on just making it a room, no kitchen or bath, just electric alone. Electrical and plumbing almost always requires a permit. It is best to call the local building department to get details. What about if your home is zoned for medium density? I was told by a zoning person that I could only do an addition or turn the house into a duplex. I take it that means no accessory dwelling units, including a shed? In this case, would they be more likely to allow an RV type tiny house in the yard? You should call the zoning staff person back and ask that specific question since “medium density” means different things in different municipalities. Most places (unless it is deed restricted) allow you to have a shed. Accessory Dwelling Unit rules vary greatly from town to town, and even from neighborhood to neighborhood. Few areas allow Tiny Houses on Wheels behind primary residences for full time living, but that is changing slowly as well. What if u have a room but wanna turn your shed into a room because it’s bigger? What do u have to do? It depends on what you want to add to the shed. You can usually add electric to a shed and finish it out on the inside to create a usable room. However, if you want it to be a legal living space, adding a bathroom and a kitchen, you may run in to more trouble as you will have to show that it meets all zoning and building code requirements for a residential building. You mentioned that you could build a shell that would meet all fl bldg codes. Do you offer something like that in a kit? If so, what would be the cost for something like this in say a size 20×20 or larger? Would you ship to Milton, fl? Thanks! We do offer our cottages as shell-only packages where we provide the engineered architectural drawings and deliver and set-up the building shell. You would then be responsible for completing the interior, including electrical, plumbing, HVAC. It seem’s that your average joe could never do this. Building codes are insane. You can’t do what you want on your own property. However this article is of great use. I searched the subject and found this website. I wish there was a more practicable approach, maybe a replication of some one who has already done this in FL. It would be nice if they did it, documented it with pictures, maybe even a video for youtube. I hope to see this one day with free plans. Following in another’s foot steps would make this so much easier. Living in FL, I would definitely try this out in the county other than my local city, that much is a given. Most standard sheds sold in Florida are stamped on the interior “Not for Human Habitation” and can not be legally turned into homes as they do not meet Florida Residential Building Codes. Doesn’t mean that people don’t do it under the radar quite successfully, but we can not advocate for it. So sorry to hear that. We wish you all the best. if you took suppose 3 or 4 storage sheds and made a house out of it.one shed for bedroom,one for kitchen ,one for bathroom.can it be done legally and are there any places that you can still homestead and do it. If the construction meets Building Code and local Zoning, you should be able to no problem. We’ve considered building a place like that for ourselves. We’d be honored if you shared our posts! Thanks for asking.